Last count, I’d reinvented myself eight times. Eight times, I’ve started over, begun a new life, moved to a new city or country where no one knew me for much longer than I’d been there. I could be whomever or whatever I chose to be. I didn’t invent a past that I couldn’t legitimately lay claim to. I didn’t invent stories of past achievements or gloss over ones of pain and loss. I didn’t change my principles and beliefs. I simply made a conscious choice of what I would share and with whom and perhaps more importantly, how I would live my life. Most of the time, this was quite freeing. To be able to wipe the slate clean and start anew, learning from past mistakes, that’s a gift to be treasured. Eight times, I resolved to do things differently: to be more selective about the company I kept, to be more deliberate in the work I chose to do, to be more conscious about how I lived my life. I wasn’t always successful, but I tried. But some times, it was quite limiting. Those days when I was so fed up with explaining myself that I longed for someone who could identify with the litany of neuroses that come with being Irish. I craved an ear that would listen to my woes and then fix it all with a sympathetic shrug and a call for another pint. I wanted to be able to sit in company and say nothing and still have everything understood. There have been times during these eight reinventions when I’ve lost sight of what I wanted to be. Times when I was so caught up in day-to-day living that any grander plan I might have had took a back seat. And then there were times when life stood still and the realisation that no one within driving distance knew me, really knew me, suffused me in the grey light of loneliness. There’s something comforting about being with old friends, people who have known me for years, and years, and years. The easy way that conversation flows across the table, evoking memories of times past, and even bringing to light things that had never before been part of the common lore. Sitting around a table in the local, focusing on those present and not on incoming texts or who is coming through the door. We weren’t expecting anyone. We were all there. 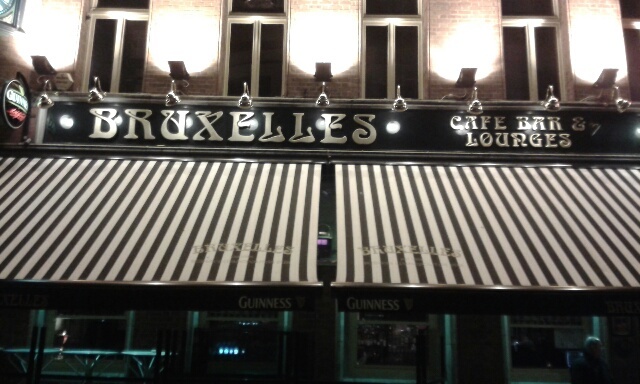 And then after last call, the suggestion to head into town to Bruxelles taken up by three of us in whom the weakness was very strong. Unplanned. Spontaneous. Living the moment. 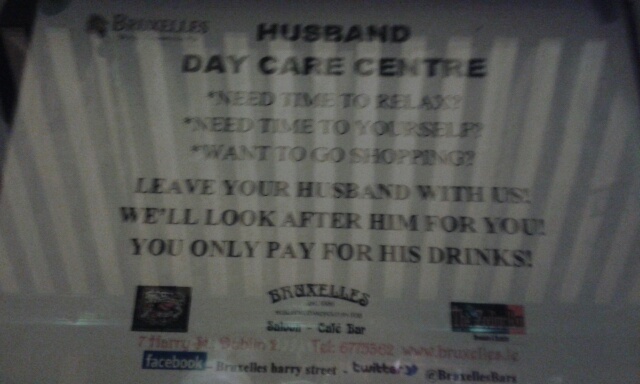 Bruxelles has a few things going for it, other than the fact that it opens late. It’s age appropriate. The music is recognisable. And it doesn’t matter where you dance. Or with whom. A cracking night on the tiles in Dublin and one that didn’t take a lot of recovering from. Then down home to see the inimitable SF, a classmate from the Class of ’83, trip the light fantastic in a Strictly Come Dancing fundraiser. Eighteen couples took to the stage, having been coached by professional dancers. They’d been practicing for weeks, a practice that showed in some more than others. But the courage to get up there, don the glad rags, and strut their stuff in front of 600 or so friends and neighbours and colleagues. Amazing. If I had to pick one national characteristic that makes me proud to be Irish, it’s the sense of community volunteerism. From local GAA clubs to Parent/Teacher associations to Tidy Towns committees, unpaid volunteers hold up their hands and step forward. Others agree to put their reputations on the line and take to the stage to raise money for some worthy cause. And the crowds come out, en masse, to support them. Rumours of €50 000 being made from tickets sales, raffle tickets, and sponsorship appear to be well founded. And that’s for one night (albeit the culmination of weeks of work on the part of so many). Remarkable. Up until a couple of years ago, I’d lost touch with the class but did those silent 30 years matter? Not a whit. And it comes back to that shared background, those shared experiences, the shared memories. And while we might have taken different paths and chosen different lives, we all started from the same village school and that starting point is a fixture that is one of the many North Stars that guide my life. As decisions are made and new paths unfold, I’m grateful for the structure and the security that old friends provide. For their advice and their wisdom, and for the learning their experiences provide. PS C’mon the boys in green!!! Your boy’s in the Green certainly gave the English something to remember this weekend. Hope that cheered you, as you cheered them. Old friends, that must be good.